Banoffee = Bananas + Toffee. 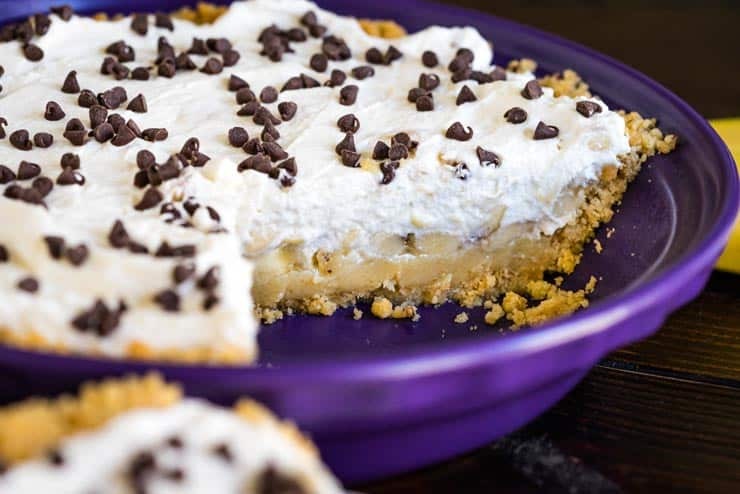 It starts with a crunchy shortbread crust, followed by a rich, thick and luxurious caramel sauce, topped with fresh slices of bananas and copious amount of whipped cream. Sounds good, eh? What Are The Origins of Banoffee Pie? Banoffee pie was invented in Brittain in 1971 at The Hungry Monk Restaurant in East Sussex. 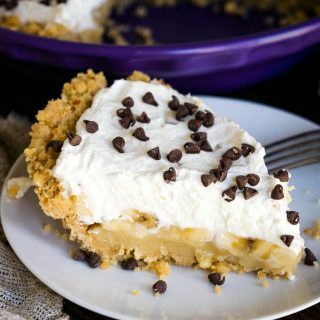 The owner and his chef were trying to perfect a recipe for an American “coffee toffee” pie and the final result was this banana version. It’s been a classic recipe ever since. Use name-brand sweetened condensed milk for the caramel layer. Budget sweetened condensed milks sometimes contain stabilizers that prevent the caramel from setting up as it should. I’ve tested this recipe with both Eagle Brand and Nestle (Carnation) with good results. Boil the filling for at least 1 minute, stirring constantly to be sure the caramel sets up as it should. Nobody likes a runny pie. Bake your pie crust— some cookie crust recipes assure you that they do not need to be baked to stay crunchy. I like to make sure my crust stays crisp by baking it before filling– about 8 minutes. The contrast between the crisp crust, soft caramel, bananas, and light whipped cream really makes this banoffee pie magical! Use Heavy Whipping Cream— When shopping for whipping cream in the dairy aisle of your grocery store, look for the term “Heavy” on the label. This simply means that it has a higher fat content and will be better for whipping. The extra fat allows the cream to whip stiffer and be more stable. Can Banoffee Pie Be Made in Advance? Yes, but fresh bananas are always better. If you’d like to make this in advance, omit the step of stirring chopped bananas into the whipped cream as these bananas in the whipped cream brown easily. If you’d really like to thwart brown bananas you can spritz the slices with a little bit of lemon juice before layering on the caramel. Need More Killer Dessert Recipes? I’ve Got You Covered! This Apple Bundt Cake with Caramel Pecan Frosting is loaded with fresh granny smith apples and topped with a rich caramel pecan sauce. It’s basically my favorite thing, ever. Try my Ultimate Ambrosia Fruit Salad to bring a little sunshine into these dark wintry days we’ve been having. Or give this No Bake Key Lime Cheesecake a go! It’s cool and refreshing and another great way to bring a little sunshine into your day! 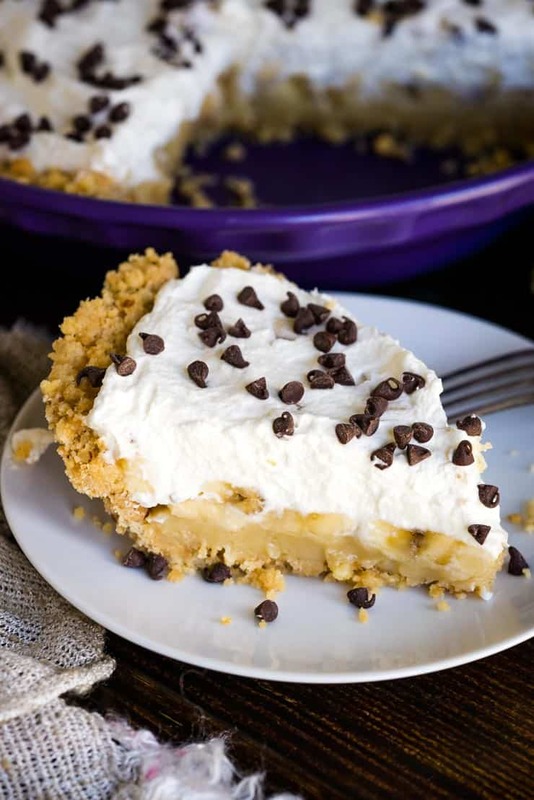 Banoffee Pie is chock-full of fresh bananas, thick caramel, shortbread, whipped cream, and topped with chocolate-- what more could you want from a pie? Place cookie crumbs, sugar, and butter in a large bowl and stir with a fork until the mixture resembles wet sand. Press crust into a 9” pie plate until it’s very compact. Bake for 8 minutes or until just starting to brown. Remove from oven and allow to cool completely. Melt butter and brown sugar over low heat, stirring constantly until sugar is completely dissolved. Stir sweetened condensed milk into the pan and bring to a boil, continuing to stir continuously. Let boil for 1 minute for a thick, golden caramel and remove from heat. Pour caramel into cooled crust and spread evenly. Place in fridge and allow to cool for at least an hour. In a large bowl whip cream, sugar, and vanilla together until stiff peaks form. Fold in some chopped bananas, if desired. Slice bananas and place in a single layer over the caramel. Top with the whipped cream and garnish with chocolate chips, shavings, or cocoa powder.